I did great if I do say so myself. *wink* After seven days of on again/off again prodromal labor, I was exhausted already going into the big day… but was just so glad to finally make it into established labor. Bubs had turned posterior so I had some pretty intense back labor (which also might explain the week of on/off labor) but got through it by the grace of God and some incredible cheerleaders! 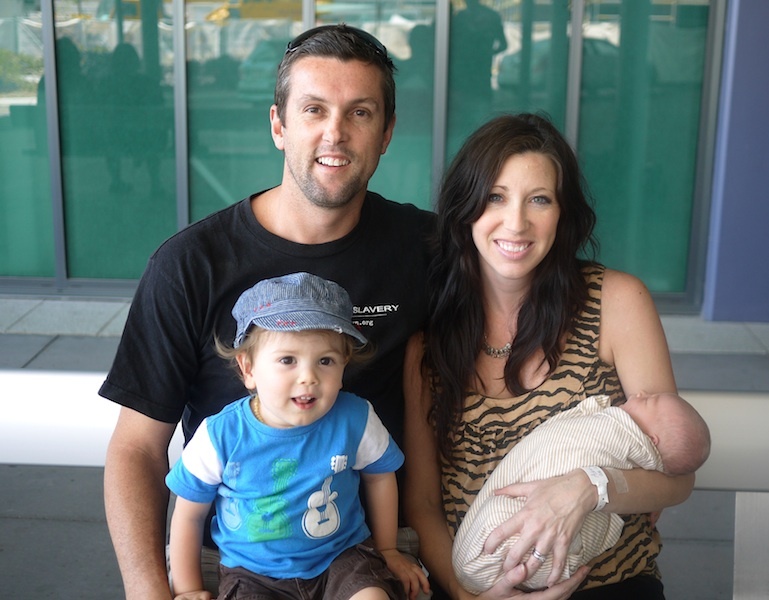 Ryan was amazing helping me through the labor and delivery, as were my friends Katie and JP who supported us. I seriously had the best birth team ever and am so grateful! 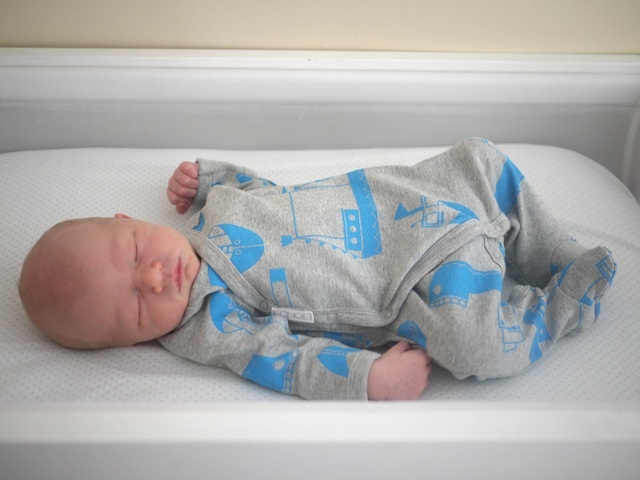 Everything went according to plans and I got to have my natural birth (and VBAC) like I had hoped for with the lovely midwives that were on duty and assigned to me (Helen and Lucy – more heroes!). He came out with his cord wrapped around his leg, shoulder, and neck, but it was just a tangle – nothing too tight to worry about. Not only that but he also had his hand up with his head… fist-pumping his way into the world, no doubt excited to meet us! The highlight was getting to “catch” him myself as he came out. It was the most incredible culmination of all of the events of this pregnancy and birth… and it still makes my head spin when I think about how awesome that moment was. Jude’s breastfeeding is going well and so far he has been very settled and content and peaceful. He has lovely skin, long fingers and toes, a cute pudgy nose, perfect little lips, and light blonde hair! Pediatric doctors examined him after birth and again yesterday before we were released from the hospital. As far as we can tell there are no indications of Down Syndrome. We are relieved and grateful! There is still a small question mark around the issue of his kidneys so he will have an ultrasound in a couple of weeks to check it out further and just confirm everything is ok. We’ll also take him back to the hospital in two months to see a specialist for one more evaluation and to make sure he’s progressing normally from a developmental standpoint. We expect nothing out of the ordinary and left with very positive feedback from the doctors. What an awesome answer to prayer! Levi doesn’t quite know what’s happening at the moment. He’s very sweet with Judah but probably doesn’t really understand that he’s part of the family yet. Surely he’ll figure it out soon enough, especially now that we’re all home together! Like any toddler, he’s interested in Jude on his own clock – kissing him one moment and totally disinterested the next. One of our favorite moments so far has been when Ryan and I drove home from the hospital today – looking back to see two car seats full of our precious boys in the back seat. We’re very happy and it feels so right to now be a family of four! Thank you from the bottom of our hearts for all of your prayers and support as we’ve journeyed this pregnancy. It’s been a wild ride, that’s for sure! We’re just grateful to now have our boy on the outside, safely in our arms. He is lovely in every way and we are absolutely sure he will bring joy to many. Judah has a two-fold meaning: to call on the name of Yahweh and to confess, praise, or give thanks to God. Matthew means gift of God, which he is and has been since the moment we learned of his existence. We feel both his names are so fitting. Again, thanks for loving and celebrating our boy so much! He certainly is a special one. Proud mama to Judah and Levi, and smitten wife to Superman himself (Ryan). Oooooh congratulations!!! And it sounds like you did GREAT during your birth experience!! What a beautiful thing! Judah is just gorgeous and you look fabulous!! Tears of joy, my friend! He is BEAUTIFUL! And praise God for such a clean bill of health! I am so excited for you guys! Love&Hugs!! Congratulations to you and your little family! It sounds like you really had a wonderful experience with this delivery, and he is fitting in well. Oh my goodness, Adriel, he is beautiful! Congratulations to you, Ryan and Levi! Judah is such a handsome strong name. He *looks* like a Judah too!! My breath is completely taken away. Yay God for such a wonderful birth experience too! And a double YAY GOD for little Judah’s health. God is good, life is sweet, and I hope you can catch some sleep 🙂 Praying for your swift healing, and Judah’s continued good health! You look marvelous, what a beautiful family you have! So many answered prayers, and what a testimony his name is!! Congratulations! Beautiful name, beautiful baby, beautiful family. God is so good! How perfect you all look together! I’m so happy for you all! SO excited for you guys! What a beautiful family (you specifically look AMAZING! You dont look like you just gave birth at all!) Judah is ADORABLE (of course) We are continuing to pray everything goes well for Mr. Man! so happy for you all! congrats. and so very happy to hear he was given such positive reports. have been praying for you both. good job, momma! Praise the Lord for your gorgeous, sweet healthy boy! So very happy for you and your family! Congratulations!! I’m beyond happy for you and your whole family. It’s wonderful that you were able to have your natural birth and have such a beautiful experience. 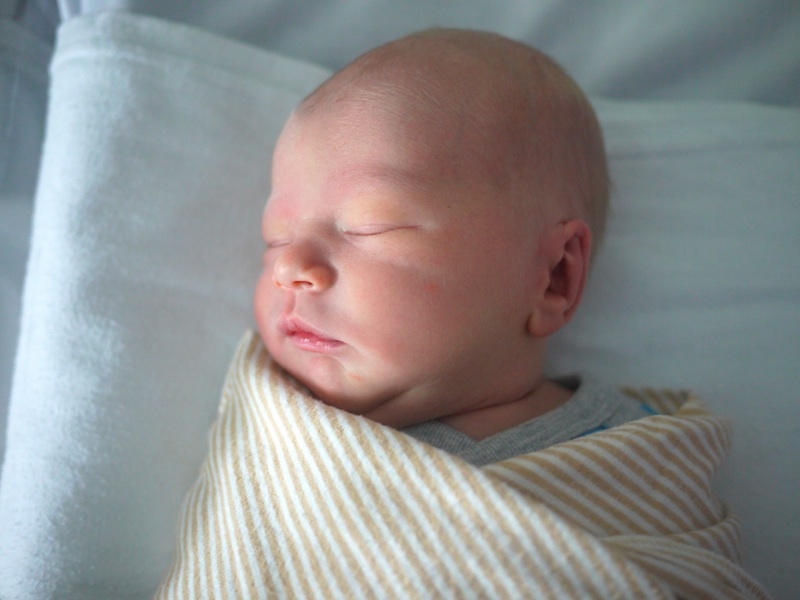 Judah is gorgeous and I’m so happy to hear that he is healthy. Also, you look a-mazing! We haven’t even gotten it together to take a family pic and our little one is 3 weeks old. I’m in awe of you! Oh Adriel I am so incredibly happy for you! He is beautiful and I couldnt be happier that he is so healthy. All the fears are over. You can now enjoy your sweet little boy with ease. You have lots of fun and crazy brotherly love ahead of you. Take it from me who has 4 boys! I am so glad you were able to have a natural delivery experience. It is truly like nothing else in this world. To pull your precious baby onto your own chest is something spectacular. You did Amazing mama! So so happy for you and your family! Hurray! A VBAC and a healthy baby! I’m praying for your transition to be easier than you thought possible and for some extra napping opportunities for you! Praising God with you! Judah is gorgeous, just like his Mommy! So happy for you and your family. Get some rest Mommy! he is a perfect little boy!!! congratulations to you and your sweet family 🙂 your strength and faith through so much uncertainty has definitely been an inspiration to me. Oh my gosh!!! How adorable! I didn’t get a chance to read the whole post yet, but I had to look at the pictures!!! Oh, and we have the same blanket! I have tears in my eyes from reading this! What a beautiful baby and a beautiful birth! I am so happy for the four of you 🙂 And his name is so wonderful!! Congratulations! Oh my he is beautiful. Congrats on your new baby and being able to have the birth that you wanted. Enjoy your new family!!! Tears of joy and happiness for you and your precious family. What a squishy little pile of goodness. Congratulations! I’m so happy for you and your family! It’s incredible how all things are possible with God’s grace. I can’t wait to hear about how your life has changed with two and I look forward to sharing our journeys through motherhood for this second time around! Get some rest! You’ve done well! He’s beautiful! Hooray! I’m SO SO happy for you. What wonderful news. Oh and he was born on our wedding anniversary— double happy day! What a beautiful baby boy! This post made me cry! God bless you guys! Cherish every second! Congratulations beautiful family. Isn’t our God magnificent!! He looks absolutely wonderful! Congratulations! He is so beautiful!!!!! Congrats on the VBAC. I wont get mine, but its okay. I had a feeling by the end that it wouldn’t pan out. I’m cool with it. But I am so glad you got to have yours!!! You rock!!! Welcome to the world Judah! He is adorable for sure. Love that he came fist pumping into the world! Saw your blog on momcomm this morning and had to stop by – so beautiful and great stuff here. Congratulations!!! I love his name. And you all look amazing! Adriel. Congratulations to you and your family! Judah is adorable and I love his name too. That is awesome that you got to have the birth you hoped for and more importantly that Judah is healthy. Congratulations! What a beautiful boy! God is so good! Yay! YAY! So happy for you. He is beautiful. Congrats! Congrats! Your story has been so encouraging as I find myself 30 weeks pregnant with our second little boy (first born is now 26 months old). We have had difficult ultrasounds this pregnancy and had a couple soft markers for down syndrome or trisomy 18 (edwards syndrome). I too opted against the amnio and going off faith that this little guy is exactly who God wanted him to be. We wont know for sure until his is born what his health will be. Thank you for sharing your story and I have been following it now for the last couple months. You had/have such an insiring outlook and I was almost put to tears when I saw your post about your healthy little Judah. I used to write regularly on my own blog, and keep up with as well as comment on your blog frequently. But since I have a 3yr old and a 20 month old, free time is hard to find, so commenting has fallen to the wayside. I just wanted to take the time now to say congratulations, I am so happy for you and your family! Your little boys are precious! 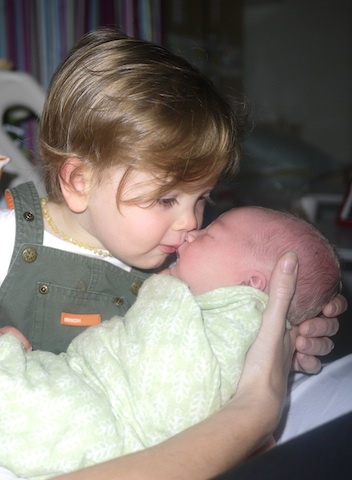 Life with two kids can be hectic but so amazing to watch the sibling relationship develop from the very beginning. Enjoy every moment, and expect the rough days still knowing that you are a great mom even on those trying days! My son also had issues with his kidneys. I can’t remember specifically what the diagnosis was, something about one being enlarged and some water around/on them. We had to have a few ultrasounds done on him, as well as have a specialist read the results. I wanted to reassure you (if this is similar to your son’s diagnosis), that more often than not, this is something that corrects itself within the first year or so. Our son had an ultrasound shortly after birth, and again at six months. After the specialist read the ultrasound at the sixth month mark, he said our little guy was in the clear. Ahhhhh! That was me screaming. I have not been keeping up, and now, here is sweet, baby Judah. Dang, great name, Adriel. Praying you and your sweet family are adjusting to life with two kids and that you are getting loads of napping time in. Beautiful! Simply, beautiful! I’m so glad to read that your vbac was a success and that your family is adjusting beautifully. You are blessed beyond measure, Adriel! Congratulations! Congrats Adriel! He is BEAUTIFUL! God is good and you and you’re family are so blessed by this new addition. Thank you for sharing this picture!